Near the period of exams, students are stressed with study. Luckily, ESN always provides many interesting activities for students to have a rest in the nature and release their burdens. 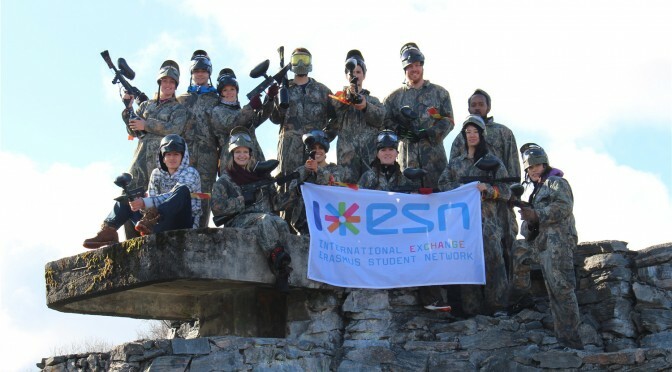 Last Saturday, ESN Molde organized an exciting paintball game for the first time, which was a brand new activity for all of the participating students. Paintball is a game in which participants simulate military combat using guns powered by air pressure to shoot capsules of paint at each other. Due the high air pressure, shooting someone at a range of 3 meters or shorter is not allowed, because it is dangerous and becomes «Painball». The battle field was located at Vevang batteri, a tranquil place surrounded by ocean and forests, where you also can see a panorama of the famous and magnificent tourist attraction in Norway – the Atlantic Road. The battle field is a mixture of woods and jungles, with a huge bunker, several trenches, and two strongholds dispersed inside. Before our warriors went into the field, everyone was equipped with a strong helmet, one camouflage uniform and an air gun with 100 bullets inside. Everyone have chances to reload the gun with a limitation of 500 bullets. Students were divided into two teams. Every team’s mission is to protect the flag from being taken by the other team and to eliminate opponents by tagging them with the paintballs. Because of the weather conditions the day before, the ground was muddy with melting snow, which lead to some inconvenience. And unfortunately, a Russian student, Max Panfilov got hurt during the second round and had to quit the game. With cautions and carefulness, students continued the game. As students heard the whistle, which means someone took the flag, students exchanged headquarters and fought another battle. Students enjoyed an adventurous, magnificent and wonderful afternoon during the spring period when they are preparing for exams. There will probably be another paintball game for students next semester. The only thing students really need to know, is that they should be careful when playing this game. Forrige innleggSkal kvalitetssjekke dansk ingeniørutdanningNeste innleggHiMolde – hva skal til?